European finance ministers agreed late on Sunday to ease the Growth and Stability Pact rules which eurozone members must abide by. The new rules will make it easier for eurozone countries to keep their deficits within 3% of national income. European ministers now have more flexibility over the costs they can exclude when adding up their deficits. Under the deal, Germany can exclude its reunification costs and France will leave out military and aid spending. This is not a licence to run up debt. 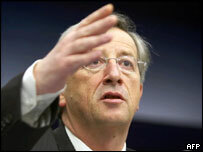 The deal is set to be endorsed by EU leaders this week. "We're going to submit this text on which we reached complete agreement to heads of state and government at their summit on Tuesday and Wednesday," said Jean-Claude Juncker, Luxembourg Prime Minister, who chaired the meeting to discuss the stability pact. "I spoke to enough of them during the meeting to know there will be no long debate and no fierce controversy," Reuters reported him as saying on Sunday night. The new rules should make it easier for eurozone countries to meet the Growth and Stability criteria without having to cut government spending. There will also be greater leniency for new EU members such as Poland and Hungary. If these countries introduce pension reforms that increase their budget deficits, they will get a five-year grace period. This will make it easier for them to adopt the euro. For the past three years, France and Germany have breached the rule that says government budget deficits should not be more than 3% of gross domestic product, a measure of economic growth. Greece has also breached the limit while Italy's method of reporting on its deficit has been questioned by the European Union. Many countries argued that the Growth and Stability Pact rules were put in place when economic growth was stronger. They say greater flexibility is now needed to increase spending in more difficult economic times. Growth in the eurozone is expected to be less than 2% this year. The BBC's Manuela Saragosa in Brussels says the new rules may alarm some critics who worry that reforms could lead to sloppy government finances, resulting in higher interest rates. 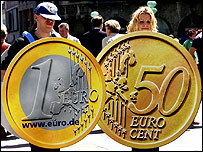 "This is not a licence to run up debt," German Minister of Finance Hans Eichel told reporters. However, earlier in the evening, the Austrian finance minister said it would be "a bit of a joke" to exempt reunification costs for an event - the fall of the Berlin wall - that happened 15 years ago. Can the European Stability Pact survive? Q&A: What is the European stability pact?